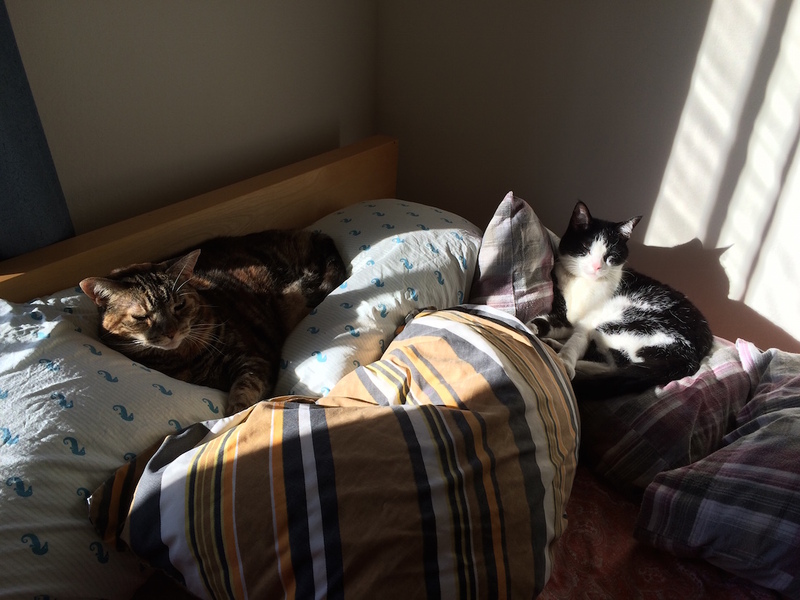 A few days ago, my daughter Basha sent me a photo of the two cats that she and my daughter-in-law Maura adopted from a shelter when they lived in New York. Then today, while waiting in a doctor’s office, I learned that this month is National Adopt a Shelter Cat Month. Coincidence? I think not. So I am posting the photo my daughter sent me to show you that these cats live the good life! The tabby on the left is Pica and the cat on the right is Bunny. The dappled sunlight makes the photo especially delightful. If we were allowed pets, I would go to a shelter for a cat of my very own. Thanx to my daughter for the photo. Perfect timing! This entry was posted on Thursday, June 30th, 2016 at 3:32 pm	and is filed under Leftovers / Feedback / Miscellaneous. You can follow any responses to this entry through the RSS 2.0 feed. You can skip to the end and leave a response. Pinging is currently not allowed.